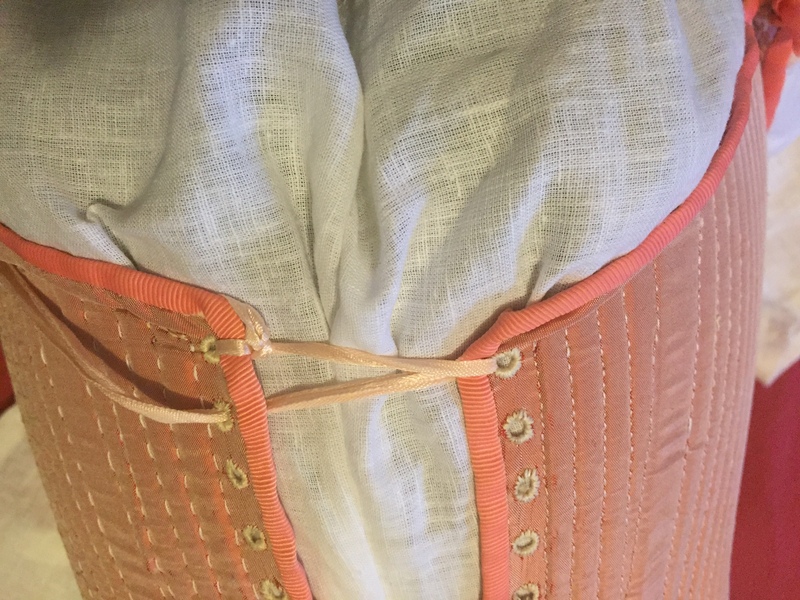 The final step of making these bodies was to create the seventy or so eyelet holes that lace the centre front together and attach the skirts (or farthingale) to the bodies. This long and narrow, but blunt, tool was pushed into the fabric creating a gap between the warp and weft threads, creating a small hole. 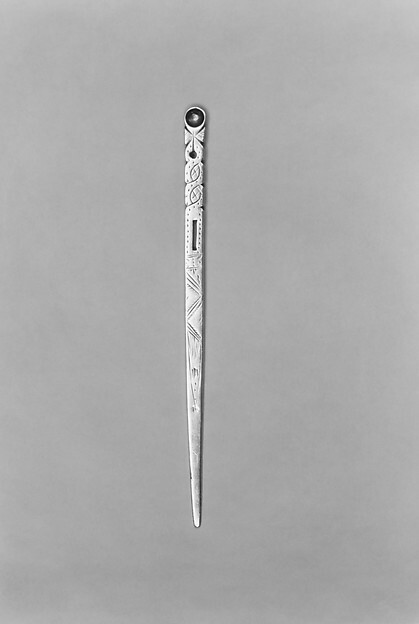 The genius in using this particular tool is that by not breaking the threads of the fabric, the resulting eyelet holes “were able to withstand a considerable amount of strain without deforming or ripping.” As well as creating the holes, bodkins were also used to thread the lacing through the eyelets, as this example from the Metropolitan Museum of Art in New York contains a hole through which to thread the lacing, similar to a sewing needle. 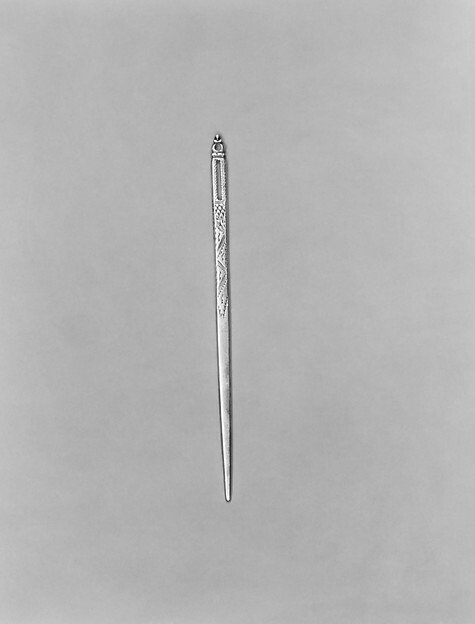 Silver Bodkin, c. 1620-40, British. Metropolitan Museum of Art, New York Contains the intials MP – possibly those of the craftsman that it belong to? 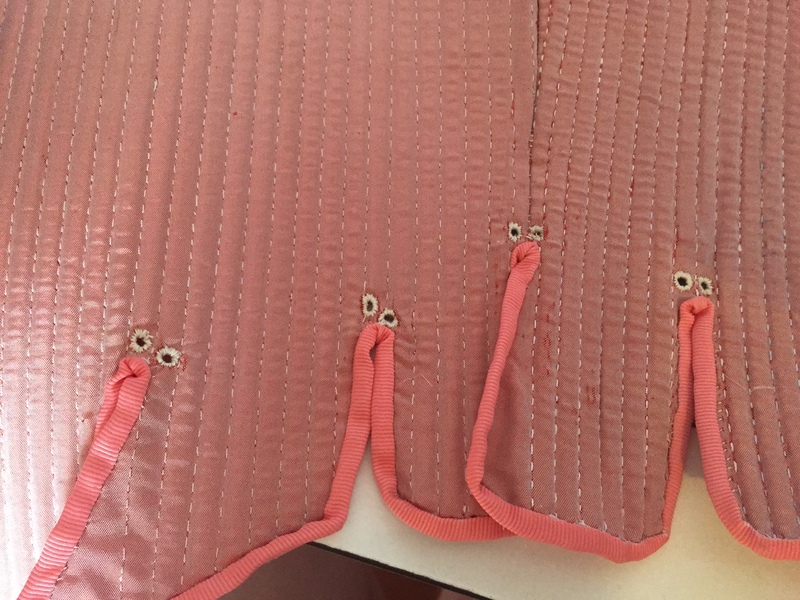 Although the original has 29 pairs of eyelet holes that run down the centre front of the bodies, somehow I miscalculated my measurements, so my reconstruction only has 28 pairs of eyelet holes. Oops! 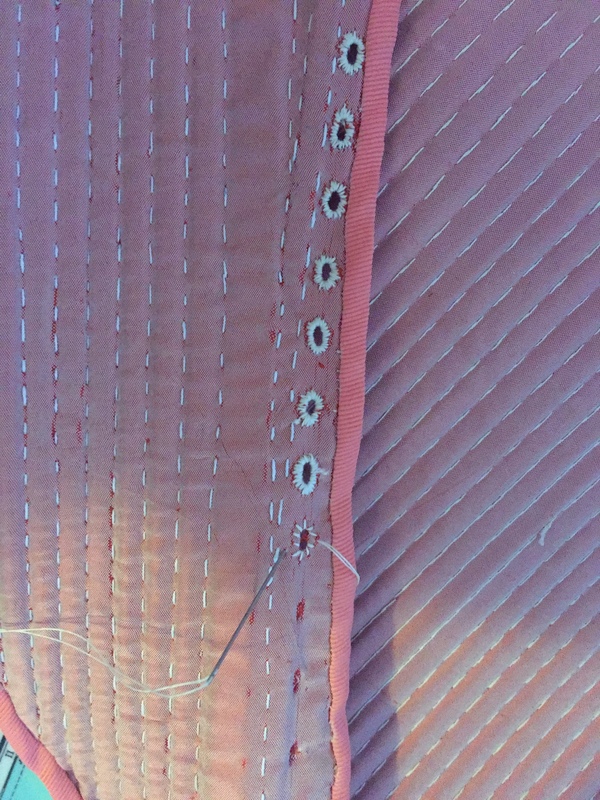 After finishing the centre front I moved onto the eyelet holes that are about the waist tabs, two above each split. These eyelet holes were originally intended to have anchored the farthingale or skirts to the torso, showing the ways in which bodies and farthingales by the early seventeenth century began to accommodate each other in dress. The original effigy bodies in Westminster abbey fastened with leather points that were threaded through one eyelet hole in each shoulder strap and then through another in the top of the bodies. The original holes were not worked, however, this was probably due to the rushed nature of making the bodies for the Queen’s effigy and so I decided to work mine with silk thread as I had done for the others. I then threaded through some left over grosgrain ribbon that I had used to bind the outside raw edges of the bodies and tied these in a bow. After the eyelet holes were complete and the shoulder straps secured, all I had left to do was to lace the bodies together. Bodies during this period were straight laced, meaning that one lace was threaded through all the eyelet holes in a spiralled motion. 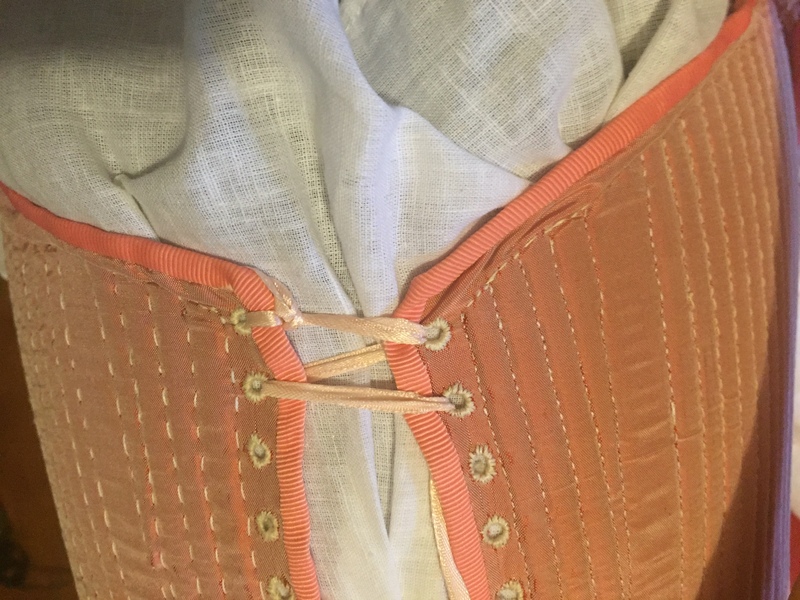 This differs from the way that Victorian era and modern corsets are laced, which involved having two strands of ribbon that criss-crossed over each other. 1. 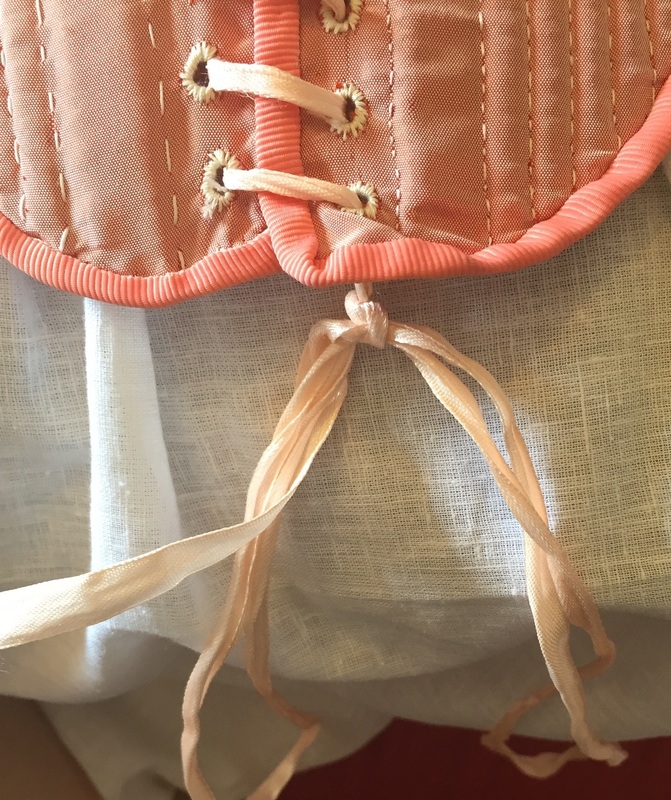 On one side of the bodies, at the top of the centre front, tie the ribbon or laces to one of the eyelet holes. 3. 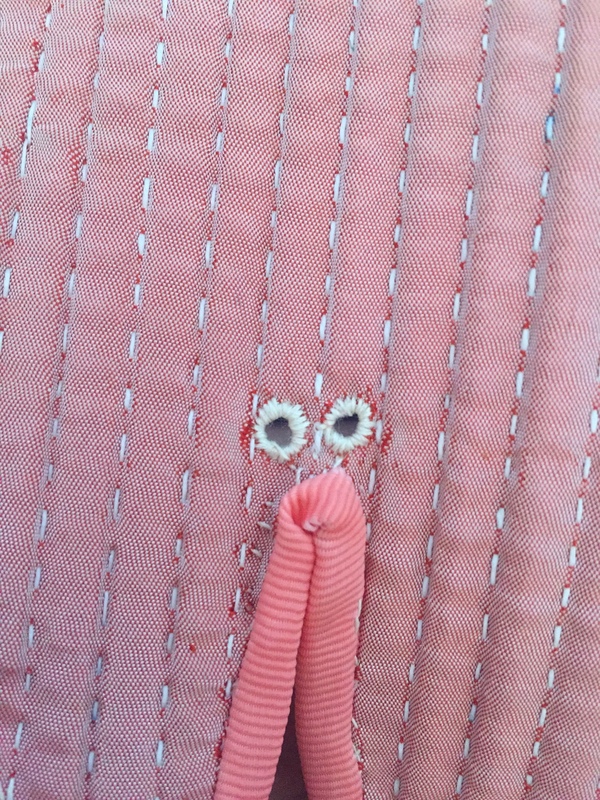 Pull the ribbon to the other side and thread through the eyelet hole, from the body towards the front. At the moment the bodies are laced together with satin ribbon, however, I hope to source aiglets in the future to create period correct ‘points’. 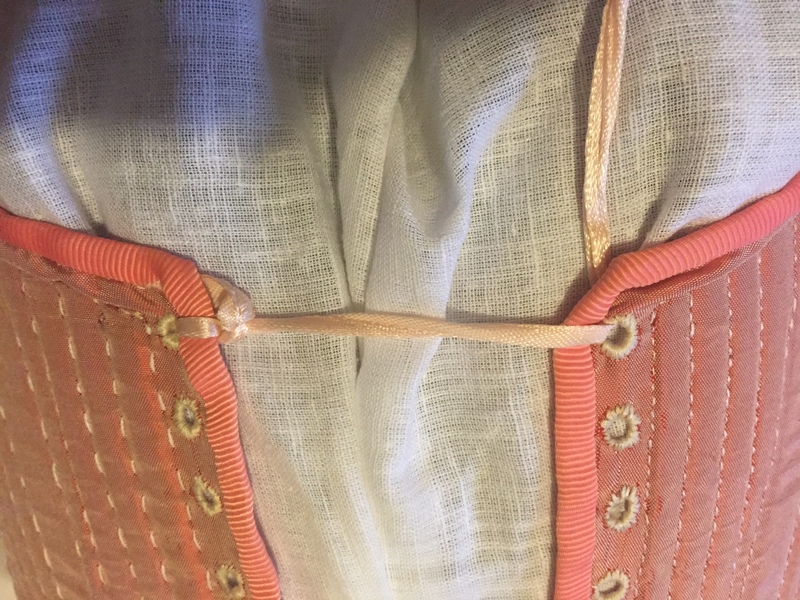 Points were laces of leather or ribbon tipped with a metal tip (aiglet) that threaded through eyelet holes in garments and tied to attached them together. 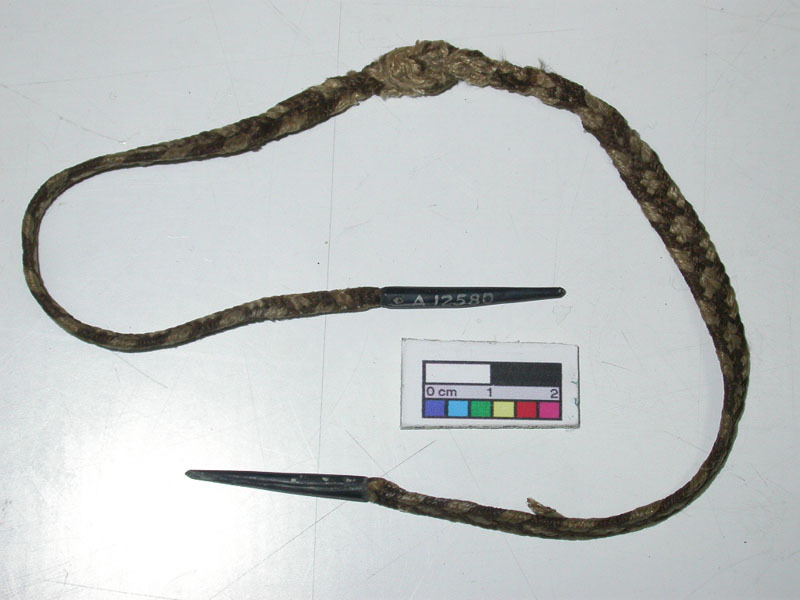 A point consisting of five strand braid of cream and silk threads tipped with an aiglet, c. 1550-1650. Museum of London, London. 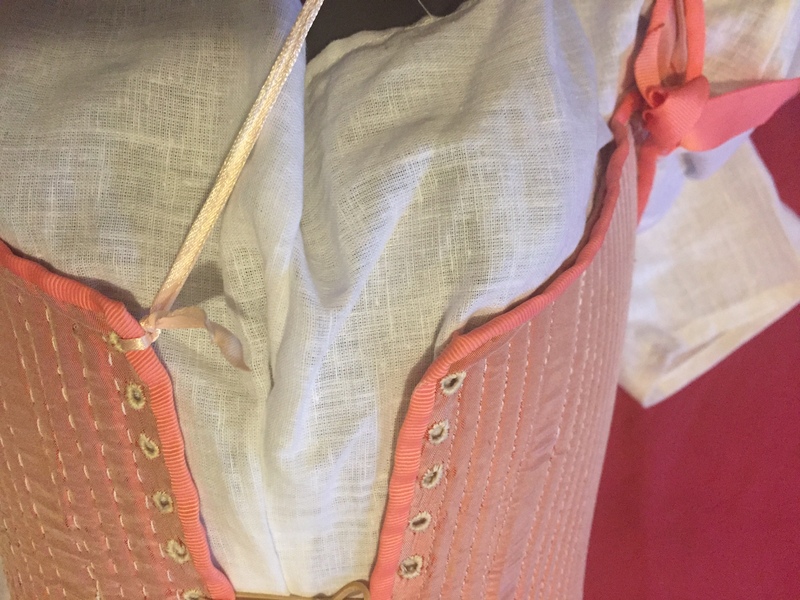 It was not only used to lace bodies, but in male clothing they were used mainly to attach the breeches and sleeves to the doublet, whilst in female clothing they commonly attached skirts or detachable sleeves to the bodice. The plastic tip at the end of a modern shoe lace is derived from the metal aiglet, and serves a similar function – to allow for easier threading. I’ll be unveiling the finished bodies and my afterthoughts on the construction process in my next blog post so stay tuned! Randle Holme, The academy of armory, or, A storehouse of armory and blazon containing the several variety of created beings, and how born in coats of arms, both foreign and domestick. With the termes of Art used in each Science. (Printed at Chester by the Author, 1688), p. 290. Luca Costigliolo & Jenny Tiramani, ‘The Tools and Techniques of the Tailor and Seamstress’, Seventeenth Century Women’s Dress Patterns: Book One, Susan North and Jenny Tiamani, eds. (London, V&A Publishing, 2011), p. 11. Janet Arnold, ‘The ‘pair of straight bodies’ and ‘a pair of drawers’ dating from 1603 which Clothe the Effigy of Queen Elizabeth I in Westminster Abbey’, Costume, Vol. 41 (2007), pp. 2, 7. Luca Costigliolo, ‘Pink Watered-silk stays’, Seventeenth Century Women’s Dress Patterns: Book Two, Susan North and Jenny Tiramani, eds. (London, V&A Publishing, 2012), p. 97. I love the progress you’re making on the bodies, they look great! When I’m doing eyelets I use a combination of a small tailor’s awl that I got from a sewing shop (you can get them from Morris Bros. in the CBD, or maybe even at Spotlight) and then I use a bigger awl that I got from Mitre 10. I find that using the smaller awl first and then enlarging it with the bigger awl means that I break less threads. Lovely work and very impressive! 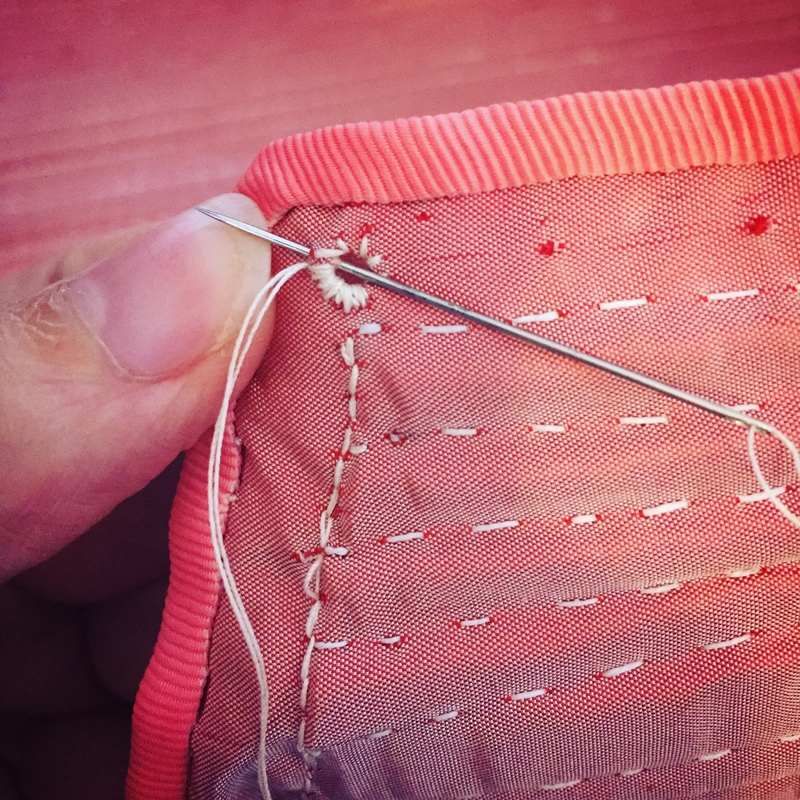 For medieval eyelets, I find a 5mm knitting needle works perfectly as an awl.